＞ The 2018 Eniwa Happy Halloween Festival is coming soon! The 2018 Eniwa Happy Halloween Festival is coming soon! 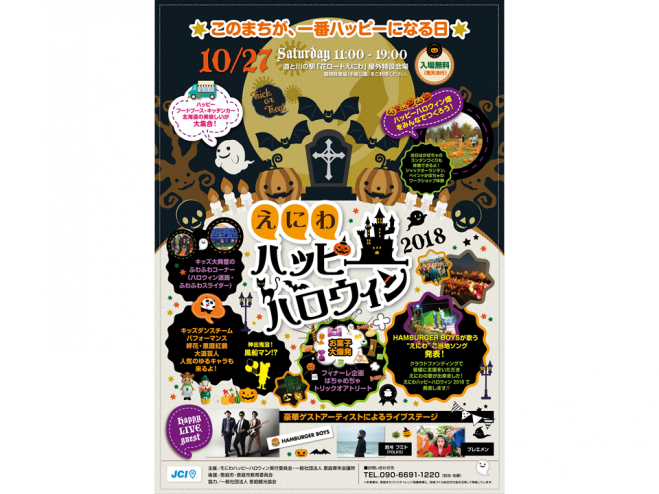 The exciting 2018 Eniwa Happy Halloween festivities will be held at the Road Side Station “Flower Road” from 11:00am to 7:00pm, on October 27th (Saturday). This thrilling event is organized by the Eniwa Youth Council, a committee devoted to the younger generations. Festival goers can enjoy childrens dance performances and experience handmade Jack-o’-lanterns. The “Hometown Song of Eniwa,” produced by HAMBURGER BOYS and successfully crowd funded, will be debuted during the celebrations. There will also be other live stage performances by special guest artists and a happy food booth with an autumn flare, so bring the whole family to join in on all the fun!